← Giveaway: Journey Down Huckleberry Finn’s Big River at Adventure Theatre! Whether you’re looking for ways to teach kiddos about MLK, want to give back on the Day of Service, enjoy live entertainment that pays tribute to his legacy, or join a special event to observe the occasion, these recommendations will have you covered. If you want to volunteer on the MLK, Jr. Day of Service, there are many ways and places you can do so around the area. Start here to find opportunities that suit your family. For more places to volunteer as a family that aren’t included in the official MLK Day of Service database, this KFDC post has suggestions. All of the organizations listed welcome kids to help out, though some have age requirements, so be sure to note them. If the Smithsonian museums re-open by the weekend, drop in to the National Portrait Gallery to listen to a story about Martin Luther King, Jr. and complete a hands-on art project. Read more about the program and museum here. Many public libraries are hosting MLK-inspired events and activities geared especially toward children. Make an “I Have a Dream Craft” at Southwest Library, join a “Social Justice” Family Story Time at Woodridge Library, enjoys songa and stories of freedom and peace at Petworth Library. There are just a few happenings in DC. For quick links to see what’s happening at other libraries around the area, see this KFDC post (scroll all the way down for links). Celebrate the life and legacy of Dr. Martin Luther King with community art activities. Each year on this weekend, Annmarie invites guests of all ages to help create a community art installation in honor of a dream. The 2019 MLK Days project is a community of clay figurines led by visiting artist Pinkie Strother. There will also be a tent of many colors filled with coloring supplies that all are welcome to use to create. KanKouran West African Dance Company returns to Dance Place for their annual celebration of Martin Luther King, Jr. Introducing the essence of traditional African dancing and drumming to audiences, KanKouran enriches American cultural heritage through the integration of authentic West African arts and promotes intercultural understanding. This annual MLK Day concert celebrates 35 years of fulfilling their mission of “giving back that which was lost.” *The Sunday 4pm performance is part of the Family Series – Get 1 free ticket for a child 12 & under with paying adult. Pay tribute to Dr. King at places that honor his legacy. 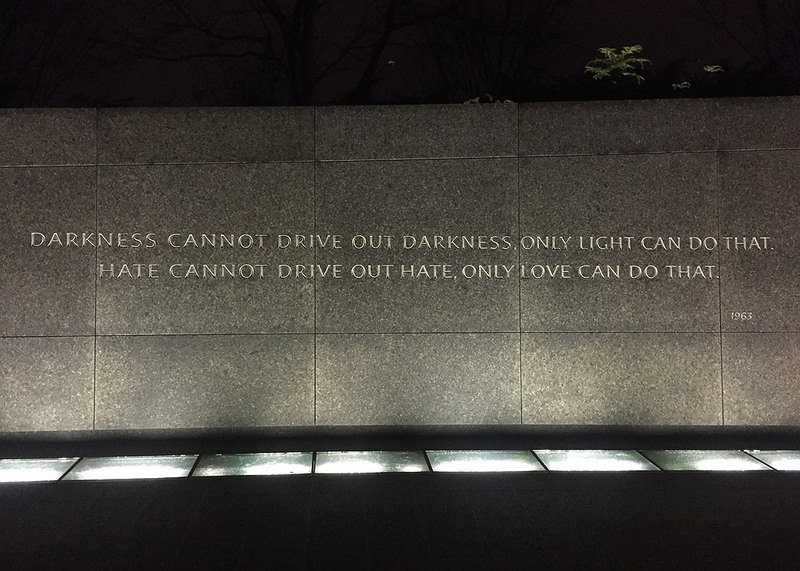 Visit the MLK Memorial, a powerful and poignant site along the Tidal Basin. From there, you can head to the Lincoln Memorial where Dr. King gave his famous “I Have a Dream” speech and see if you can find his words etched in the stone there. Visitors Center and facilities are closed due to the shutdown, but you can still visit the rest. For a guided walking tour that includes those locations, check out DC by Foot, which offers name-your-own-price tour options. The American Visionary Art Museum will pay lively tribute to one of the world’s greatest visionaries, Dr. Martin Luther King, Jr. with its annual, all-ages-welcome event. The intergenerational community party honors the great Dr. King’s legacy and vision with birthday cake, performances, film footage of his speeches, a hands-on art activity, complimentary museum admission, and more — all of it free for everyone! Read more about the wonderful AVAM here. Montgomery County celebrates Dr. Martin Luther King’s life through dialogue, presentations, music, and theatrical performances. The program also incorporates audiovisual elements, showcasing projected videos and photos throughout the event. Free tickets are required for this event, and will be distributed onsite the day of the performance. Limit four tickets per household. Commemorate the life of MLK, Jr. on a peace walk and parade along Martin Luther King, Jr. Ave. The Peace Walk begins at 10am at 2500 MLK Ave SE and ends at the Barry Farm Recreation Center. The MLK Parade will commence at noon from Good Hope Road near the Anacostia Park entrance and continue up MLK Avenue, concluding at the campus of St. Elizabeth’s East with a Health and Community Fair at the Gateway Pavillon located at 2700 Martin Luther King Jr Ave SE. All ages are welcome to join. Rockville’s 47th annual Martin Luther King Jr. Day celebration will include multicultural performances, awards, and a keynote speech by Justin Hansford, the executive director of the Thurgood Marshall Civil Rights Center at the Howard University School of Law. The program’s theme of “Enduring Hope, Enduring Progress” will reflect on how to keep hope alive while enduring tough times. The celebration is free and open to all ages. A reception will follow. Join PJ Library and Federation’s Doing Good to show your children the Jewish value of tikkun olam (repairing the world) by assembling healthy snack bags and laundry kits for those facing hunger and homelessness in our community. We will also celebrate Tu B’Shevat (the Jewish New Year of the trees) with a holiday-related activity and story time. Pre-registration required as this program WILL fill. Cost is $20 per family to help offset the cost of food and supplies. If the registration fee would cause a hardship, please contact them for a free or reduced rate. This program is intended for children ages 4+, but everyone is welcome. At this annual performance in honor of MLK Day, the Kennedy Center and Georgetown University host a musical celebration of Martin Luther King Jr.’s legacy. This year the concert will feature Tony, Emmy, and Grammy–winning artist Audra McDonald and Tony-winning artist Brian Stokes Mitchell along with the Let Freedom Ring Choir led by Music Director Rev. Nolan Williams Jr. Free tickets will be given away up to two per person in line in the Hall of Nations starting at 4:30pm on a first-come, first-served basis.